The Following is from my open letter regarding my departure from the Libertarian Party and pending registration with the Republican Party and Republican Liberty Caucus . It can be accessed here on Radical Capitalist. 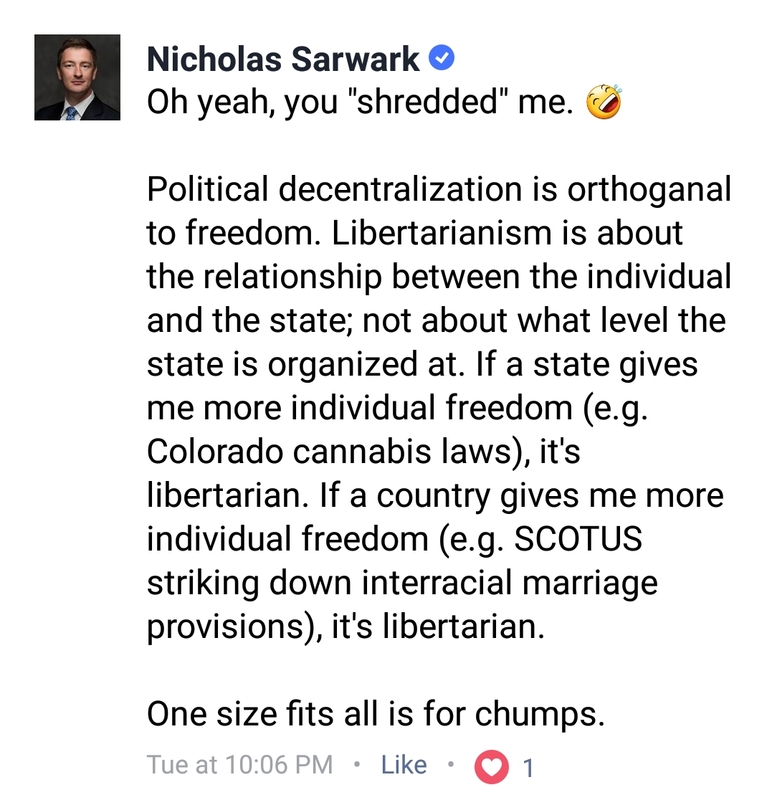 Perhaps one of the top reasons I am leaving the LP emerged after I announced my intentions to leave: Nicholas Sarwark does not understand libertarianism. In a comment on my initial reaction to Sarwark’s tweet in which he attacked Rothbard and Tom Woods, Sarwark proves this. To start, Sarwark misspells “orthogonal” (I know, I’m being petty). But in all reality, Sarwark outed himself as a legal positivist with this comment. Legal positivism maintains that law is a social construct rather than a natural aspect of human nature. In other words, the Law is whatever man makes it out to be. A classic example of legal positivism is the philosophy of Thomas Hobbes. Hobbes and the legal positivists claim that the legitimacy of the Law is no concern so long as the law itself exists. They are heavily reliant upon the social contract. In an even better twist, the alt-right is heavily influenced by Hobbes and legal positivism. This is one of the greatest differences between the alt-right and libertarianism. The alt-right is Hobbesian, positivist, and follows the idea that order must be created and maintained. Libertarianism stems from the natural law tradition, which dictates that law is a part of human nature (which is discerned to be self-ownership and therefore compatible with liberty by means of argumentation ethics), and follows the concept of spontaneous order which stems from human cooperation. In this context (and therefore every context, arguably), Sarwark is closer to the Nazis than any libertarian could ever be. Sarwark fails to realize that the government cannot give personal freedom to me. Government can only take away personal freedom as it is simply a monopoly on violence. Government cannot be libertarian as it violates the fundamental principle of self-ownership and non-aggression. The State transforms all private property into fiat property, to be revoked whenever the agents of the State so choose. Sarwark also claims that libertarianism is about man’s relationship with the State. This is a complete misunderstanding of libertarianism. Libertarianism isn’t even a political system. It is an ethical system based on self-ownership, private property rights, and the non-aggression principle (NAP). The State and libertarianism are diametrically opposed. As the State becomes more localized, the State comes closer to abolition. In this sense, decentralization and freedom are not orthogonal. They are directly related. At best, Sarwark is confused. At worst, Sarwark is a libertine (or perhaps Hobbesian) attempting to hijack libertarianism.